You simply can’t get closer to the beach. Virtually on your doorstep; the perfect beachfront holiday. 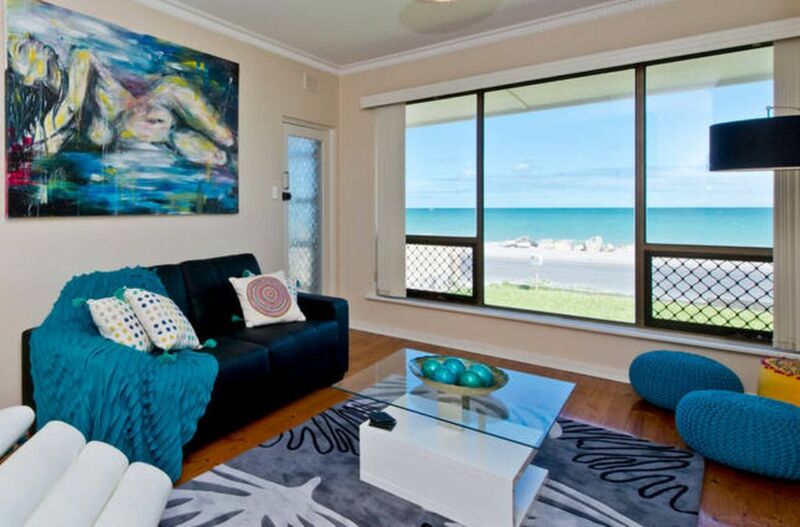 Situated right on the esplanade with uninterrupted views of the sea. This recently refurbished cottage is perfect for short or long term holidays. Don’t be surprised if you spot a dolphin just a few metres away from your holiday accommodation. Your perfect view of the sunset will be simply stunning at any time of the year. If you encounter problems booking this site, please see our other property, 'Sea By Your Side', which is in the same location and offers the same high quality and similar attributes. See - https://www.stayz.com.au/accommodation/sa/adelaide/glenelg-north/193299. Your stay here can offer you the priceless enjoyment of the constant sound of the sea and fresh air, yet ensure that you are within easy reach of all that the City of Adelaide has to offer. The City, Festival Theatre, Casino and Convention Center are all a short 15 minute drive, or an easy 30 minute trip with the Glenelg Tram. The cottage is a 5 minute beachfront walk to the sophisticated Holdfast Shores Marina and its award winning restaurants. If you’re lucky, you may spot celebrity chef Adam Swanson whilst enjoying a world class Greek culinary experience at Zucca restaurant. Another 2 minute walk and you are on historic Jetty Road, where the eating, shopping and entertainment facilities are endless. Just Google “Glenelg Beach” to see all that this destination has to offer, including a myriad of sport and beach activities. Your stay may not require a single car trip, as local attractions such as the “Temptation” swim with the dolphins, the BeachHouse amusement park & the brand new $1.3m foreshore playground are all within walking distance. This cottage offers you a stretch of lawn at the front of your very own place. Your rear portico will store outdoor chairs and a small picnic table, where you can enjoy your wine, coffee or meal. Alternatively, throw down a picnic rug on your own lawn and just stare out at the sea, sunset and the numerous walkers who are seeking to enjoy that which you will have at your very own doorstep. The cottage was fitted out in February 2016 with brand new furniture and bedding. In 2018 some items have already been replaced with new to ensure guest satisfaction. The cottage combines a clean, crisp, modern feel with the cosiness of an old cottage. The place has been fitted so that you can have a comfortable short or long term stay. It offers a fully equipped kitchen, your own laundry facilities, TV and DVD entertainment, linen and towelling – just pack your toothbrush and bathers!!. The kitchen will easily cater to those who want affordable home cooked meals; that is, if they can resist the temptation to just walk into one of the cafes or restaurants down the road. When you first get there, enjoy a coffee on us - just pop a coffee capsule in the machine. The property has a queen bed in the master bedroom. A double and single bed in the second bedroom. Both bedrooms fitted with chirorest mattresses to ensure a comfortable holiday stay. The living area contains a couch, which can be converted into a double mattress for sleeping an extra 2 if required. split system air con in Living Area.